The Peg Perego John Deere Ground Force Tractor and Trailer is a serious Ride-on Vehicle that will give your child new kinds of freedom, and a great way to carry his or her important cargo. The powerful 12-volt rechargeable battery pack (included) powers a two-speed motor that goes forward and reverse. The Ground Force Tractor includes some amazing features your kids will love, like FM radio, flip-up armrests, and travels 2¼ or 4½ mph. Works great on its own, or with the addition of the included cargo trailer. Parents control the speed with the 2nd gear lockout feature. 12–volt rechargeable battery and charger included. Made in the USA in our Fort Wayne IN Factory using domestic and global components. Warranty: 1 year Limited Warranty with a FREE 2nd year extension (requires consumer participation). Dimensions: 67 1/2" X 24 1/2" X 26 1/2". 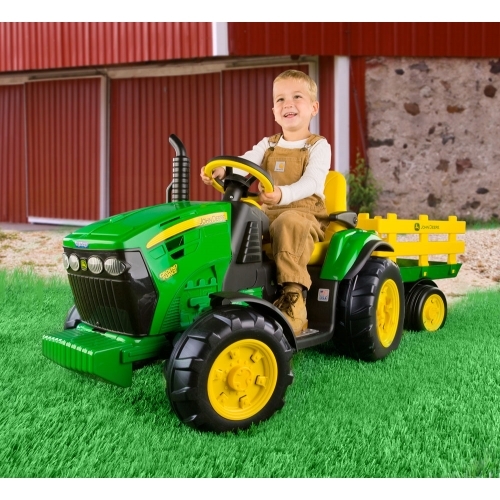 Availability: The Peg Perego Battery Operated John Deere Tractor takes approximately 2 business days to leave the warehouse plus transit time. Please Note: This Item ships ground ONLY and does not ship express or to Alaska, Hawaii, PO Boxes or APO addresses.